PhotoModeler has been used since the early 1990s as a key tool in the accident reconstructionist’s toolbox. 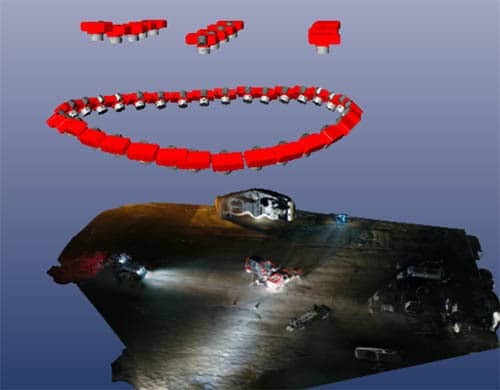 For the most part, until recently, this photogrammetry work was done with ground based photography, or if done with aerial photos, it was with a full sized aircraft. See the Scene Mapping page for more detail. Within the last few years, the use of drones / UAVs in many applications, including accident reconstruction and mapping, has taken off (no pun intended!). 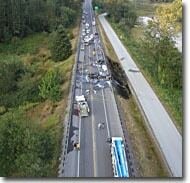 A drone can be flown over an accident scene quickly to capture all the detail. Combined with some ground photos, this allows the scene to be cleared more quickly and the road reopened. The results are accurate diagrams and maps of the scene, along with accurate distance and angle measurements that are important for the reconstructionist or the forensic specialist. Below are some examples of simulated and real scenes, done fully or partially with drone / UAV photography. 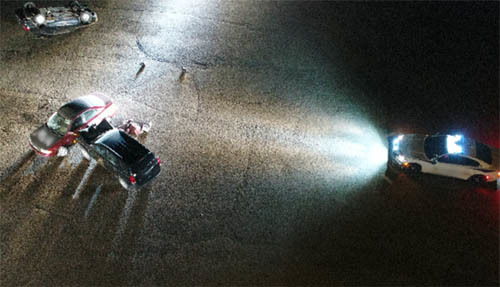 The first is a very interesting application of using a drone at night, illuminated by vehicle headlights. Can you do photogrammetry at night from a drone? It appears you can! In this case the accident scene was illuminated by street lights and vehicle headlights. The DJI Phantom 4 Pro was flown in a circular orbit plus a small grid of nadir photographs. The photos are grainy due to the low light but a SmartPoint cloud and surface were created automatically. A point cloud, texture surface model, and manual point and line CAD model were created. One of the convergent drone photos of the night scene. 3D View of textured surface model and drone camera positions. A unique strength of PhotoModeler is its ability to easy add CAD data (points, lines, curves) to the model by identifying key points on multiple photographs. Here outlines were created on the two vehicles to help with the 3D reconstruction process. CAD lines appear on the auto-extracted 3D surface of vehicles. Drone photography courtesy of Air Access Solutions and Petauro Systems both of Colorado, and photogrammetric processing courtesy of DCM Technical Services of Ontario. 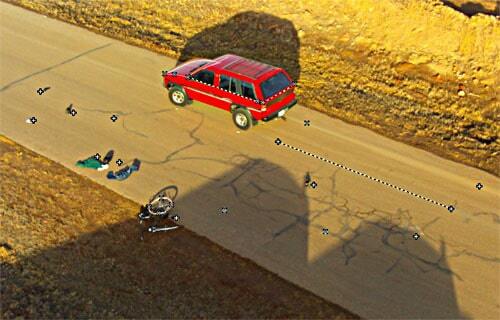 In this sample, we have a collision between cyclist and SUV on a back road. The final resting positions of the bicycle and SUV where modeled, along with the skid marks. The Aeryon was flown in a larger grid pattern with nadir photographs combined with a partial circular orbit. A total of 164 photos were captured and processed. This incident, which involved fatalities and a major vehicle fire, was photographed from the ground and from an aircraft and then modeled by one of the state police agencies. 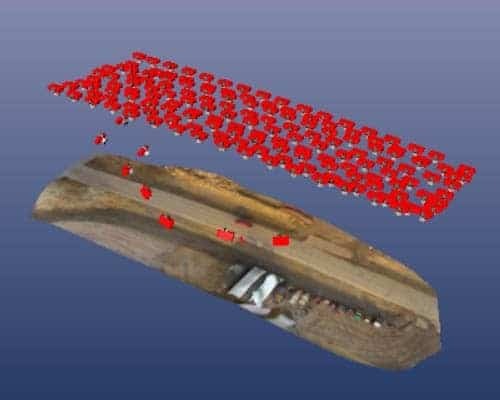 The image shows one of the aerial photos that was combined into the project.